Teenage and adult acne is a tough condition to live with. In many cases outbreaks can be so severe that medical treatment is the only option. But for the majority of people who suffer with this condition acne is unsightly, a bit sore and quite a confidence killer. And it usually pops up just in time for a bid night out. No matter how much you perfect your facial cleansing routine and adapt your diet to reduce the risk and severity, sometimes you’re just going to lose the battle against pimples and blackheads. When this happens you will have a huge range of products available that all promise to be the solution you’ve been looking for. 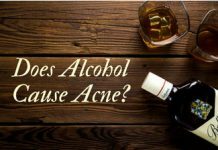 In the majority of cases, it’s just clever advertising that appeals to your emotions and need to get rid of acne quickly. To help you avoid all the poor products, and especially those that might actually make things worse, we have done some extensive research into the best products out there. All these products go beyond just the attempt to clean the skin and use different types of active ingredients to help remove sebum and bacteria to unclog your skin’s pores. Before we move on, it’s highly important that you understand how OTC products work. 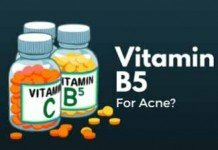 This will significantly help you evaluate the best over the counter acne treatment for yourself. 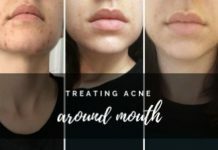 OTC acne products work in different ways. 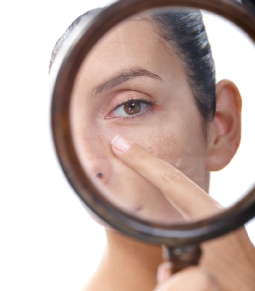 Some aim at preventing pore clogging, some fight bacteria on your skin, some decrease inflammation, and so on. 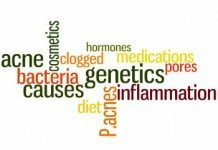 How a product will deal with your acne is highly dependent on the active ingredient(s) used in it. 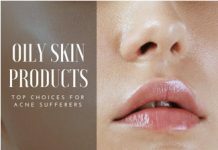 There are 5 main active ingredients OTC acne treatments use, including benzoyl peroxide, salicylic acid, alpha hydroxy acids (AHAs), sulfur, and resorcinol. 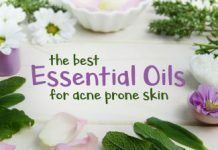 Each of them have their own unique properties to fight acne (which we’ll discuss later on this post). In this blog post, I’ll discuss the properties of each of these active ingredients in detail. 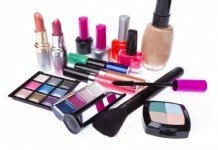 You’ll know for which type of condition products based on that particular ingredient are effective. You’ll also get to see their pros and cons, and best acne products that are based on those ingredients. Alpha hydroxy acids or AHA is the name given to a group of different acids. These are common natural acids found in certain types of food. This includes citric acid (which is commonly found in citrus fruits), glycolic acid, and lactic acid. 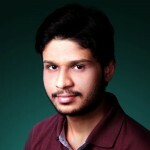 It is a common treatment for dealing with acne. Products based on AHAs can help to deal with dry skin which, of course, clogs up the skin pores and causes inflammation. There is also some evidence that it can reduce the appearance of acne scars and help shedding the dead skin cells. This, essentially, makes it a very effective treatment. It is perhaps the most suitable ingredient for dry skin. These acids can actually penetrate pretty deep into the skin. This means that not only is the top layer getting some benefit from the alpha hydroxy acids, but the lower layers are too. 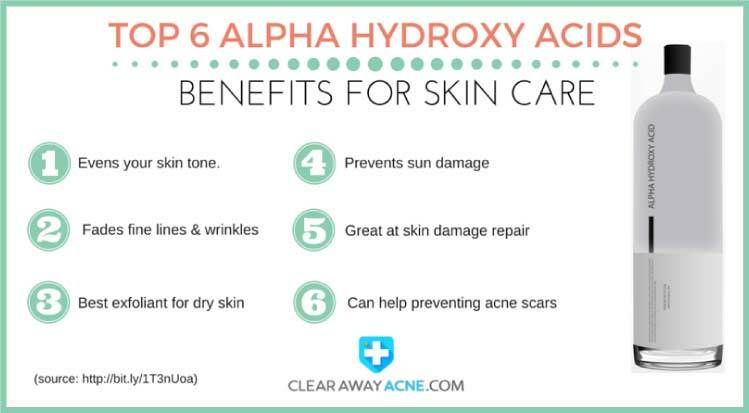 In many cases, a few applications of alpha hydroxy acids is all that is really needed to keep the acne at bay. This is a treatment which works best only for those who have acne caused by excessively dry skin. It is also worth noting that some people may suffer from mild skin irritation when they use this medication. It will only be very minor skin irritation, which is not much of a problem. But if that occurs then you should try and stop using the medicated product as soon as possible. Just to ensure that you are not making your acne worse. 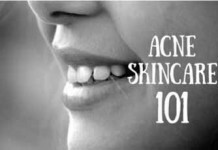 When it comes to over the counter acne treatments, salicylic acid is one of the most commonly used ingredients. Quite often, it will be one of the first medications that your doctor suggests that you use. That’s because it’s highly effective. Salicylic acid works by boosting the amount of moisture that your skin produces. This, essentially, means that your skin will have a far easier time of keeping itself clean. The main reason as to why you will want to keep your skin moisturized is because it will help to break down dead skin cells which have clumped together and clogged your skin pores. Salicylic acid dries up your whiteheads (closed comedo) and blackheads (open comedo) like a charm – for the reason it’s highly effective at opening up your clogged skin pores. 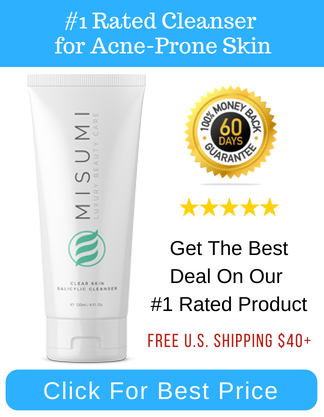 It gently peels of the top layer of your skin, which makes it highly effective if you want to gently and effectively shed dead skin cells from your skin. In some cases, people have had to deal with skin irritation, skin peeling, and redness of the skin. It is very rare that this will happen. 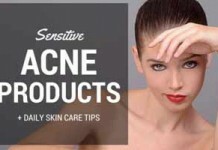 However, if it does, you need to stop using that SA based acne product as soon as possible. You should, therefore, inform your doctor that you are suffering from an allergic reaction. 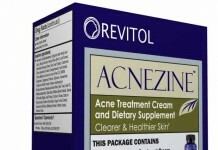 When it comes to the treatment of mild or moderate acne, there is no treatment used more often than Benzoyl Peroxide. This is because it can perform a number of different jobs. For starters; the Benzoyl peroxide will stop bacteria thriving on the skin which, straight away prevents acne formation. In addition to this, it will cause the skin to peel away. 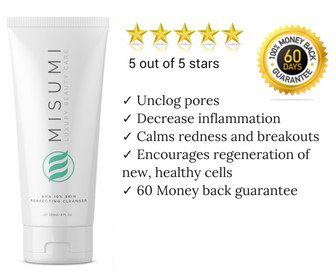 This will essentially help rejuvenate your skin. Majority of Dermatologists recommend benzoyl peroxide as the first medication that you should use against acne. 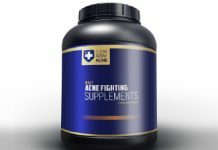 In most cases, it will be all that you need to get rid of your acne. You can purchase it ‘over the counter’ pretty easily too. If this product does not work, you may need to look into alternative treatments which are going to be quite a bit stronger. Whilst it is very rare that people will suffer a reaction to benzoyl peroxide, it is not unheard of. Therefore, you really should keep an eye out for any signs that your skin is being irritated. A little bit of peeling is fine, but if you notice the inflammation on your skin getting worse, you should discontinue its usage and contact your Derm. 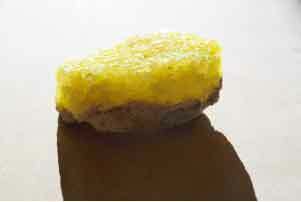 Sulfur, even when you are not treating acne, is incredibly beneficial to the body. It is important in ensuring that your bones, hair, and just about everything else stays perfectly healthy. It, of course, plays an important role in skin health. 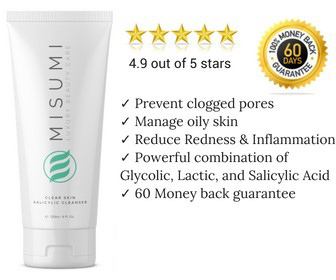 This is an incredibly gentle over the counter acne treatment. It helps to ensure that the skin cell turnover in the problem areas is kept to normal levels. 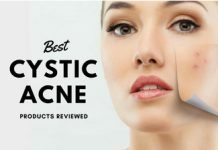 It will also make it a bit easier to get rid of all of the dirt, oil and skin cells which are clogging up the pores causing you to suffer from the acne. One of the main reasons as to why sulfur is used so often in various medical treatments for the skin is the fact that it acts as an antiseptic. 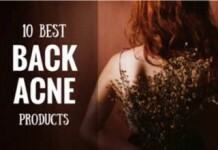 The other acne treatments that I have mentioned on this list do not. You want an antiseptic as this helps to clean out the skin completely. It stops the bacteria which causes acne from thriving and that, basically, ensures that the acne disappears. As mentioned previously, this is a treatment which is very mild on the skin. 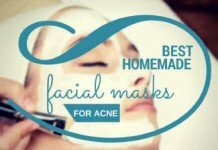 Unlike other acne treatments, you do not have to worry about it drying out your skin. It also seems to be highly effective in most cases. It is very rare that this product does not work for people, which is fantastic. There are actually very few negatives to sulfur as it is important to the body. Some people may have a reaction to it, but it is very rare. If you are having a reaction to the sulfur, it is likely that it is a reaction to whatever was ‘bundled’ with the sulfur. In most cases, switching to another product should work well. Resorcinol generally comes as a cream. In some cases, you will only be able to use it with a doctor’s prescription – depending on where you live. Resorcinol is used for all manner of different skin conditions. This includes warts and for dealing with calluses. 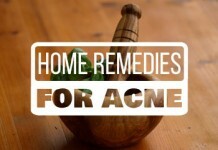 However, it tends to work very well for acne. 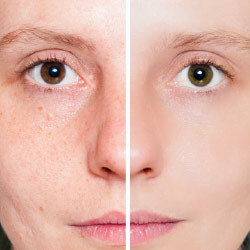 Resorcinol works by removing the dead, dry, and scaly skin. 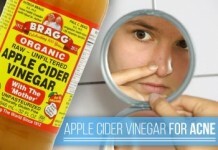 This helps to prevent acne as there is one less thing which will be clogging up those pores. It does very little else in the prevention of acne. 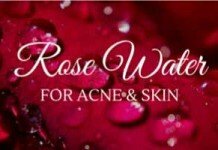 But in most cases, the removal of all of that dry skin which the body is having difficulty shifting on its own should be more than enough to keep acne at bay. Because of its tremendous skin friendly properties, topical sulfur is prescribed to cure a host of different skin conditions including psoriasis, seborrhea, warts, burns, insect bites, poison ivy , corns, calluses, sunburn, or other skin irritations. 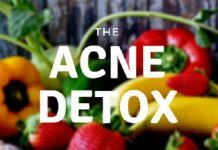 This is a very effective treatment and, in most cases, should keep the acne at bay once and for all. Most people will start to notice positive results in a week or two. But again, it’s never the same case with all individuals. If you suffer an allergic reaction, it is important that you tell your doctor sooner as opposed to later. You won’t be prescribed sulfur if dealing with a large, open wound. And it is not suitable for infants, obviously. 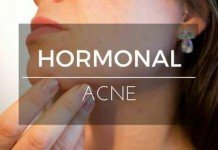 It can bring adverse affects to pregnant and breast-feeding women, and therefore, they must consult their doctor before using resorcinol based over the counter acne treatments.